Ready to fall for peanut buttery granola goodness? Got a thing for dark chocolate chunks and roasted peanuts? How about a premium granola that's also blessed with whole grains, fibre and low sodium? It'll be love at first bite. Ingredients: Rolled oats*, cane sugar*, peanut butter *, sunflower oil*, peanuts*, Fair Trade dark chocolate chunks* (cane sugar*, unsweetened chocolate*, cocoa butter*, vanilla*), cocoa*, rice starch*, sea salt, flavor*, honey*, tocopherols (vitamin E). *Organic. Contains Peanuts. Produced in a facility that uses milk, tree nuts, wheat and soy. My 12 year old son really likes this. He's not really one to like granola, but add peanuts and chocolate and he's into it. It smells really great. This is so delicious. We love it on plain Greek yogurt. Just a little bit goes a long way. Love this stuff and no guilt about eating junk! Simply perfect! We buy 10-12 bags at a time. Delicious. 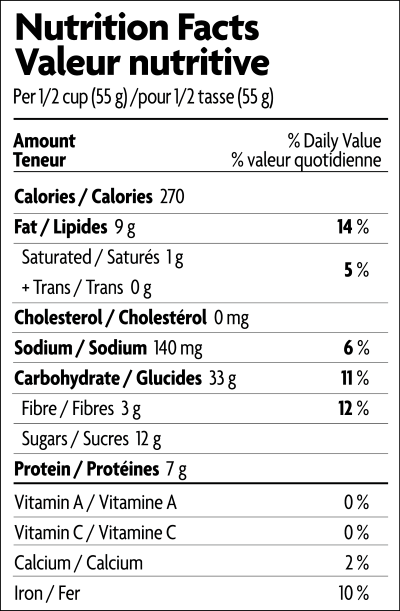 Quite high in sugar so I usually just use a couple of tablespoons on my yogurt. Mmmm for breakfast. Not too sweet but reminiscent of Reece PB cups. So good. Yummy peanut butter flavour! Tastes like Reese's Peanut Butter Cups combined with granola. Perfect for my sweet tooth cravings. OMG my new favourite thing! 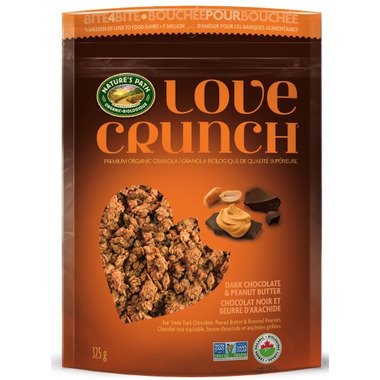 Already love the Love Crunch granolas but this one takes the cake. So delicious, you will not be dissapointed.